This is the thoroughly updated and expanded third edition of the successful The Formation of the Christian Biblical Canon. It represents a fresh attempt to understand some of the many perplexing questions related to the origins and canonicity of the Bible. 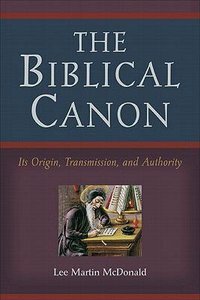 About "The Biblical Canon: Its Origin, Transmission, and Authority"
McDonald is principal and dean of theology at Acadia Divinity College, Wolfville, Nova Scotia.